I used to play Wonder Boy In Monster Land all the time, I was completely addicted to it for a couple months. I also loved Psycho Fox, Spellcaster and Time Soldiers. If I had a complaint, it would be those stupid Sega Card games. I don't think I ever played a good one of those. And really, what a bunch of nonsense to have purposely worse games. They just seemed like a complete waste of time and a marketing failure, I mean who came up with that idea? I loved my SMS back in the day. It was a far superior machine to the NES and deserved to do better in other countries such as the US. They really missed out on it. I spent hours and hours on games such as Wonderboy 3, Zillion, Rocky, Y's, Phantasy Star, Kung Fu Kid, Black Belt etc. It's conversion of R-Type was very impressive too. The SMS is one of my favourite consoles, and brings back some great memories. I played my cousins Master System and then had to go straight out and get one. Alex Kidd in Miracle World was quickly followed by Sonic 1. There was a games shop near Chessington which was externally painted like the Sega boxes with the blue on white lines, and they carried loads of Sega games and it became a regular haunt of mine anytime I was working around that area or passing it. Loads of great games on the SMS, Lucky Dime Caper, The Ninja, Enduro Racer, Operation Wolf with the light Phaser and also Gangster Town and Laser Ghost. When typing my previous post I couldn't remember the price of SMS card-based games so cheers for that. I know delusional Nintendo fans like to believe that the only reason for why Sega's Master System sold so well in Europe and Oceania was because Ninty didn't take those territories seriously - heck, we've seen that myth peddled yet again to some extent in this very month's Retro Gamer magazine. 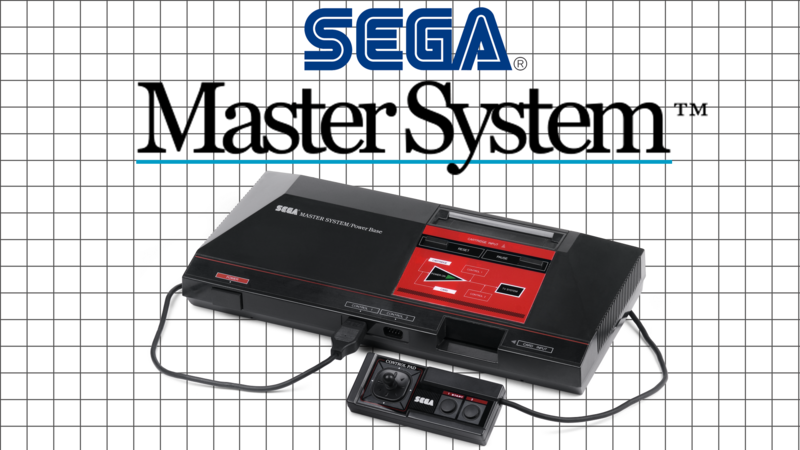 Fact is, there was much that Sega did with the Master System that was right and all credit is due to them (plus their (then) regional distribtors such as Mastertronic in the UK, Ariolasoft in Germany, etc) for what they achieved by wiping the floor with the supposedly all-conquering NES in those territories plus Tectoy's notable success with licensed Master Systems and games in South America. I'd have to have a rummage, but seem to recal The Games Machine here in UK, did a feature on these 'smart cards' that were taking Japan by storm and how various games companies were looking into using them as they were cheap to produce, needed less packaging etc. As well as Sega did'nt the MSX and NEC TurboGraphx-16 use some form of Rom cards for games to a degree? Think Sega soon gave up on them due to games requiring lot more memory than you could fit on a Rom card.What was there, all of 12 games released on Rom card on MS? The PC Engine/TurboGrafx uses ROM cards (or HuCards as they are called) and the Atari Lynx also uses ROM cards as standard too. Quite funny seen as they are both custom 8/16-bit hybrid systems based on a 6502 CPU. The Cheetah/Bit Corp. Gamate also used ROM Cards as a storage medium. I know there were cartridge games for the MSX but I don't know about card games. I always assumed that it was the large arcade culture in the US that led to the NES prevailing over the SMS here. I wanted an NES because I was playing Super Mario Bros and Excitebike on the .vs arcade machines. I didn't really know much about the SMS, as I don't recall it being heavily advertised. It is curious to me why the SMS is so popular in the UK and Europe. I'm of the opinion, through experience, that back in those days, and through the 1990's, arcades played a huge role influencing the direction of home console markets. Having never been to the UK or Europe, I have no clue how large the arcade 'culture' was in those places. I can tell you that here in America, you couldn't go to a shopping plaza and not have an arcade. I grew up in a town of 20,000 people, and I had 4 different large arcades I could ride my bicycle to 7 days a week. One was walking distance from my home, a 10 minute walk down the street. Arcades were absolutely everywhere. Even a machine or two at every gas station and convenience store. Those Nintendo .vs cabinets were widespread here. I think that has to be a major factor over the NES dominance in the USA. That the MS could'nt match the Nes in terms of quality software:Ohh right so it's not as if the likes of:Prince Of Persia, The Terminator (better than the MD cart.version! ), Phantasty Star, the Zillion series, Sonic, Spiderman, Fantasy Zone, Impossible Mission, Bubble Bobble, Galaxy Force, Gauntlet, Rocky, Master Of Darkness, Wonderboy III, R-Type, Rampage, Op.Wolf, Rambo 3, Powerstrike, Fire And Forget II etc etc were anything to shout about, eh media? And had Nintendo really put effort into Europe things would have been even better for the Nes over here, MS would have been destroyed overnight...hello? Nintendo had 2 cracks at Europe 1st with Mattel, then handling it themselves. Surely Sega deserve credit along with their European counterparts in terms of software houses, for what they did achieve with such a superb little system. The soundchip i hated, but the MD to MS conversions often had my jaw dropping in what was achieved, so great to see a dedicated thread to the underdog here at a time i seem to be drowning in Nes related stuff in the publications i buy. From personal exp.Sega were the arcade name over here for a lot of us.The likes of Out Run, Space Harrier, Enduro Racer etc were huge.We had to put up with some very mixed results in terms of home conversions to the 8 Bit micro's etc, but you could'nt seem to move in magazines for huge adverts for conversions of The Latest Sega Arcade smash! !Thunderblade, Afterburner+Outrun being the biggies, with Space Harrier, Alien Syndrome+Power Drift happily bobbing along. Plus never under estimate the impact Sonic had over here, at the time? everywhere, real major event at the time. Guess with something like the Gamemate, cards would have been ideal, cheap, your not looking at epic sized games etc.On systems like the Lynx though, how 'big' did the cart sizes go? seem to recal some issues concerning Lynx Eye Of The Beholder (which never came out, did it?) needing a big cart. Did technology increases allow for 'bigger' cards without incurring bigger production costs in later years?. Re:The Playchoice games:I can always remember the look of utter dissapoint on friends and strangers faces when they discovered it was nothing more than a Nes powering it, not some cutting edge coin-op board.I never saw anyone showing much interest in them, they just seemed to turn up in various bars and sat untouched.